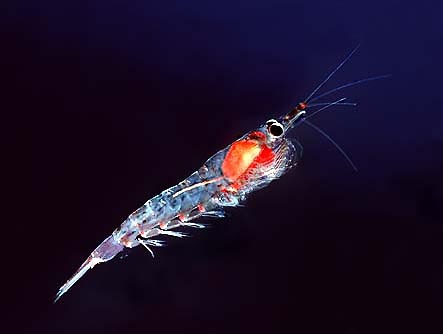 [Photo] Northern krill Meganyctiphanes norvegica. Photo by Uwe Kils. The stomach is colored intensly red from carotenoids, an indication that this euphausid feeds on copepods. Northern krill (Meganyctiphanes norvegica) is a crustacean that lives in the North Atlantic Ocean. It is part of the zooplankton. It is an euphausiid and a very important component of the plankton of the ocean, food for whales, fish and birds. In the Southern Ocean, Antarctic krill Euphausia superba fills a similar role. Northern krill is the only species of the genus Meganyctiphanes.